Just outside the village of Les Baux de Provence you can find the Carrières de Lumières. 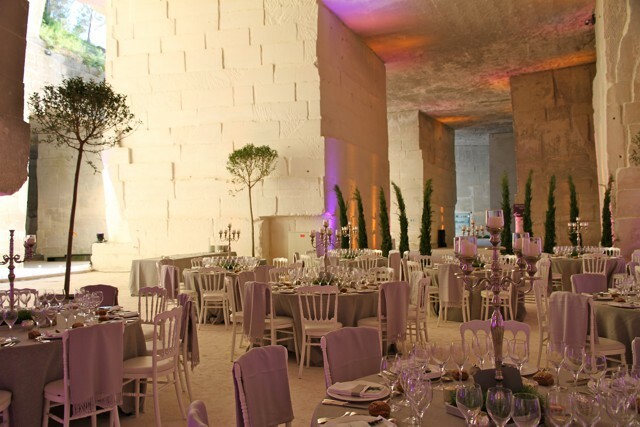 These old stone quarries were still in use back in the 1930’s and it is the stone from these very quarries that was used to build the Château and the hilltop village of Les Baux de Provence. As a site to visit they are impressive enough the high ceilings carved out of the rock, witness to an industrious past, and in the heat of summer they are a great escape! Back in 1977 based on the experimental work by Joseph Svoboda whose use of projected images in his scenography had a stage unlike any other here and a unique light show was presented in the quarries for over thirty years. 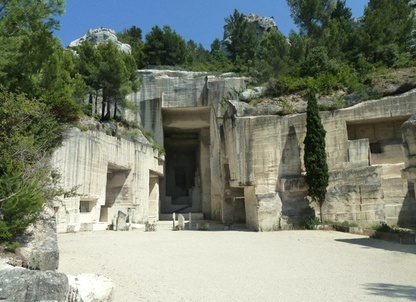 Then in 2011, the village of Les Baux de Provence handed over the management to Culturespaces, a private company dedicated to the development and promotion of monuments, museums and historical sites of several can be found in the South of France. Culturespaces continued the light show, but with a technology that literally brought the quarries to life. 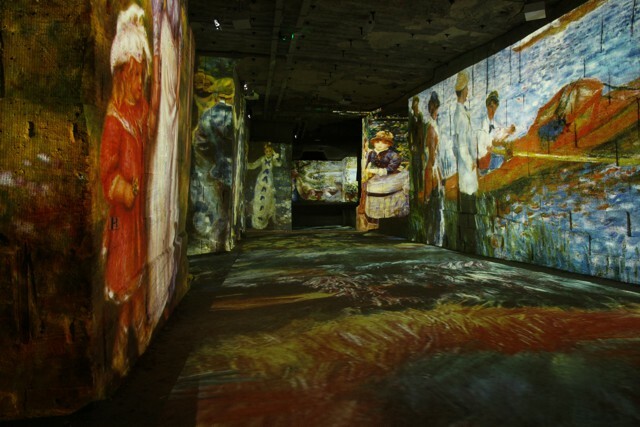 The unique system they put in place uses 70 projectors with images on every surface whose resolution surpasses that of full HD thanks to the use of fibre optics to transmit the video signals. The spatial surround sound and the precise placing of the speakers allows the spectator to live the exact same audio experience wherever they find themselves. Culturespaces renamed the site “Les Carrières de Lumières” which translates as the Quarries of Light, reinforcing the specificity of what was on offer inside. 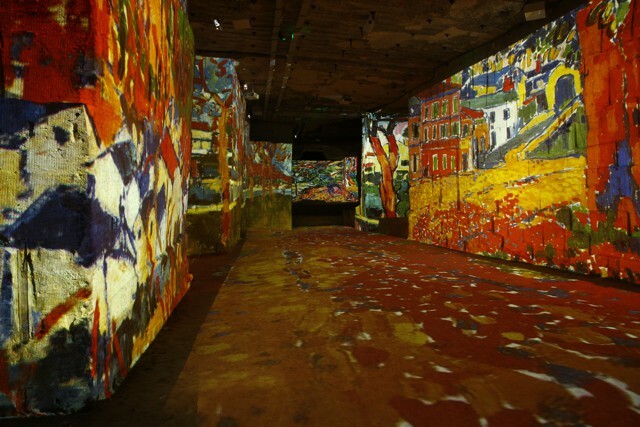 In 2012 the main light show is on Van Gogh and Gauguin whose paintings come to life, much, much larger than life, and their vibrant colours are reproduced exactly, and each brush stroke is minutely detailed. For 2013 the theme will be the Mediterranean and the artists who found their inspiration there. A four part show starting with Joseph Vernet’s view of Marseille as if arriving from the sea, and followed by the works of Renoir and Manet who left their habitual Paris and Giverny and found themselves under the spell of the Riviera. The next part highlights the light of the Mediterranean with works from the Italian Riviera to the Spanish border where the works of Cézanne, Braque, Cross and Signac in totally different styles take us on a geographical and historical journey with Impressionism, Pointillism and Cubism showing the diversity of the landscapes and artistic techniques. The final section continues on in the history of art with the exaggerated but so appropriate colours of the Fauvists and to the “Prophets of modern Art” Les Nabis. 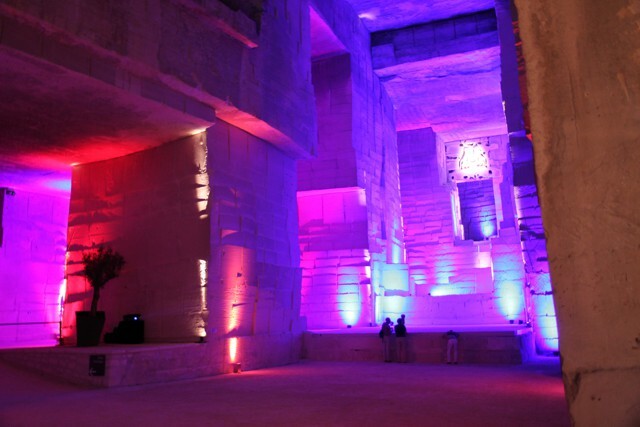 After the main light show, a shorter show called metamorphosis, uses different colour lights to show the beauty of the quarries themselves. 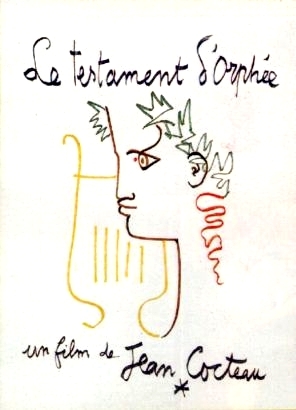 The beauty of the quarries was also noticed by Jean Cocteau in 1959 who used them as a setting in his film “Le Testament d'Orphée”, a film for cinephiles starring Cocteau himself and with a star studded cast of second roles and extras including Charles Aznavour, Jean Marais, Yul Brynner, Brigitte Bardot, Pablo Picasso and his wife, and Françoise Sagan to name but a few, all friends of the artist. As a rainy afternoon bit of family entertainment it’s a bit heavy going, but as a testament to Cocteau’s art and to the beauty of the Carrières it is worth seeing, and you can see the scenes shot on site when you visit in a projection area of the quarries. To visit the Carrières de Lumière, just follow the signs from the village of Les Baux de Provence, it is just outside. In full season it’s an experience trying to park your car, but once inside the sheer volume of the quarries and the magic of the show, makes you forget the people around you. If however you would like to experience the spectacular sound and light show for yourself with no one else around to disturb you, then you will be requiring the services of Unique Provence who can secure the privatisation of the Carrières for just the sound and light show, or if you would like to go a step further we can organise a complete evening with a gourmet meal, string quartet and anything else that may take your fancy. Due to the immensity of the site the latter suggestion is more of a group product. But having said that a candlelight dinner for two could be very romantic indeed! 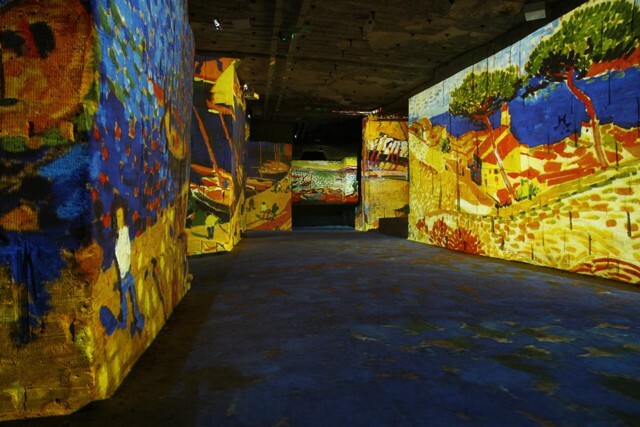 Take a look at the Unique Provence Travel website for our suggestions on privatising the Carrières de Lumières.